Happiness Is to Be… Pain Free! Home/Natural Therapies/Remedies/Happiness Is to Be… Pain Free! 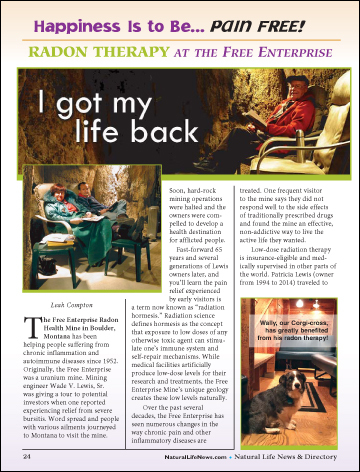 The Free Enterprise Radon Health Mine in Boulder, Montana has been helping people suffering from chronic inflammation and autoimmune diseases since 1952. Originally, the Free Enterprise was a uranium mine. Mining engineer Wade V. Lewis, Sr. was giving a tour to potential investors when one reported experiencing relief from severe bursitis. Word spread and people with various ailments journeyed to Montana to visit the mine.